I had the pleasure to spend some time with the HP TouchPad which is not yet released to the market. It seems to be slated for a July launch in Canada. I was extremely impressed and I really believe that HP is now Apples biggest threat in the Tablet arena. HP plans to distribute it through Wal-Mart and through their on-line portal. It appears that the HP cultists will be the first adopters right out of the gate. A colleague in my office is patiently waiting as he owns several HP computers and LCD screens and is a strong ranker in the HP CSAT scores. This is the first time I have seen a battery rating and theirs is 6300mA so I assume this is the standard for the claimed 10 hour run tine. 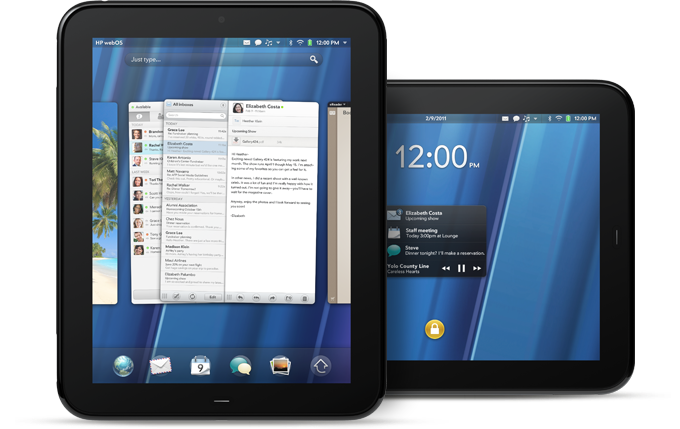 Ok, so nothing new and all representative of the current electronic technology available today but HP seems to have really taken the webOS software to an interesting level in the way of application organization. First I got to check out the excellent social connector type application that ties in all your emails and calendars into one simple interface. Bring your exchange, Gmail, hotmail and other pop3 mails all into one email application. This is simple. It also brings all your social tools like Twitter and FaceBook into on application which makes it simple to stay connected and informed within your social network. This will simplify life for those users that don’t want to worry about all of this. The multi-tasking worked very seamlessly swiping across apps. Pop ups inform you of new emails arriving and I assume any IM would be similar. The Skype application is built-in the OS which is interesting because I am sure Microsoft is a player here as they have had a long standing relationship with HP (back to the iPaq days) and the Active Sync client is still there. You can also print to any HP wireless equipped printer which again simplifys the user experience. The marketing folks are thinking smart this time as Angry Birds, Time magazine, FaceBook and Box.net are some of the apps available right away. They are talking about a Cloud Storage application to store files and the such in some kind of data locker which I think is interesting for storage of large files. Another embedded app is the JustType which allows you tot start doing things without opening any applications, write a note, calendar entry or send an email. Again simplifying and organizing the applications into a simple interface. The Beats Technology is a partnership with Dr. Dre and the sound did sound somewhat better and directly compared to the Playbook it was noticeable. So HP is doing everything RIM didn’t do and maybe by not releasing the product so fast, HP will not alienate and upset its customers with not ready for prime time products. HP Marketing is focused on having a working, buggy free, app equipped tablet right out of the gate and that’s the way it needs to be done.